A Ben's on every corner? Ben's Chili Bowl, a Washington landmark. Need a little more Ben's in your life? Wait, it's OK, you don't need to answer really obvious questions like that. 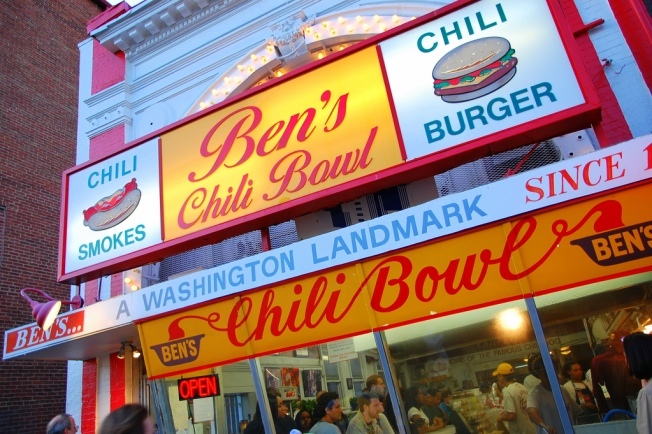 Turns out the owners of Ben's Chili Bowl are considering opening up the brand into a franchise business, the Washington Post reports. Kamal and Nizam Ali, two of late founder Ben's three sons, have seen their historic U Street spot discover international attention after visits from Barack Obama and French President Nicholas Sarkozy. "Everything's got to a point where I'm ready to consider the next thing on my plate," Kamal Ali told the Post. French President Nicolas Sarkozy and his ex-supermodel wife Carla Bruni-Sarkozy attract a crowd to Ben's Chili Bowl. Even before their father died last October, the family had begun expanding the business, enlarging the original restaurant to accommodate peak crowds and tour buses, then signing a licensing deal to provide chili and half-smokes at Nationals Park. In 2008 the family opened an adjacent restaurant and bar, Ben's Next Door, and this February welcomed a visitors center, complete with a visual history of U Street and a Ben's gift shop. Translation: Prep your tummy for imminent exposure to an increased amount of chili dogs, cheese fries and chocolate shakes. Yeah, your doctor might not be thrilled about that, but don't think about cholesterol tests. Think about the chili. OK?